The 32nd International Hot Air Balloon Festival in Switzerland attracted more than 40,000 visitors and at least 100 pilots at the controls of standard and special shape balloons. A total of 1,000 hours of flying time in nine days was achieved. Held in a scenic valley in Canton Vaud in Switzerland recently, the balloon festival was a spectacular success. This year’s presenting sponsor, as in the last five years, is Parmigiani Fleurier, the luxury watch maker. Parmigiani Fleurier’s own balloon also took to the skies and was there throughout the festival, offering flights to guests and taking part in competitive events. Along with flights of colorful balloons in different fun shapes and sizes, there were displays of hang gliding, paragliding, flying wing suits, parachuting and even aerobatic airplanes. To top off this spectacular display, a special “Night Glow” sound and light show complete with illuminated balloons, fireworks, dances, and even nighttime paragliders was held. Of course, for all those night birds out there, a huge party running until 4 am was held in the village on the weekend. What sets this festival apart from many others is the setting: the striking difference between the richly colored balloons and the snow covered landscape makes for a stunning sight. One of the highlights of this year’s event was the “High Precision Parmigiani Target Race to a watch”: The target on the launch site is an upright pole. Hanging from this was a gift box which the pilots tried to grab. This year marks a major milestone for Parmigiani Fleurier. For the past five years, the brand has been the presenting sponsor of the Château-d’Oex International Hot Air Balloon Festival. In this capacity it is reasserting its desire to help continue one of Switzerland's most popular events, and to contribute to the growth of its international scope. The 2010 edition once again provided a host of exciting air displays, balloon flights traditionally open to the general public every day, as well as particularly tough competitions mixing precision (the Parmigiani high-precision target) and technique (fox hunt). This open-air sound and light show used the snow-covered mountains as its backdrop. Choreography complete with over 300 participants and volunteers including skiers, paragliders, balloonists and firework technicians delighted the eye. A show created by their passion for ballooning by Frédéric Delachaux, Bernard Pintozzi and Jacques Morard. 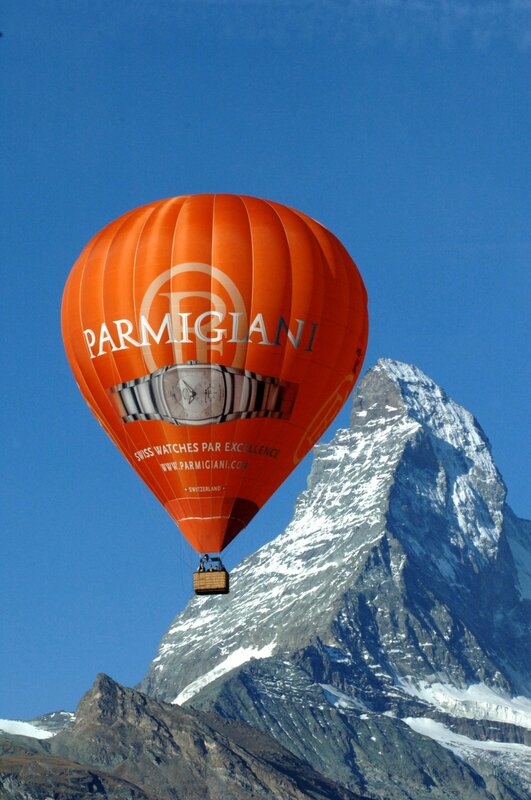 Over the nine days of the festival, Parmigiani offered its guests a number of flights in hot air balloon at the Château-d’Oex take-off area, and some took part in the ballooning competitions.